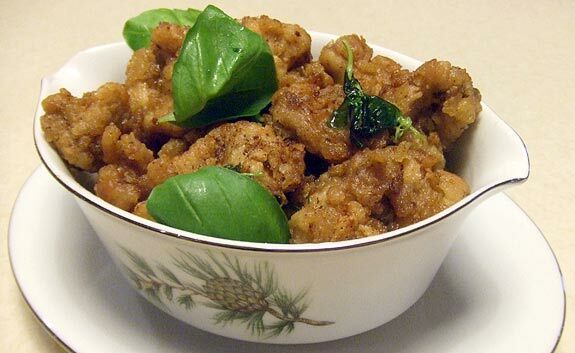 Here is a very popular Taiwanese Street Food – Taiwanese salty crispy chicken 鹹酥雞. Lots of people buy this at the night markets or at the stalls on the way home after work. If you like fried chicken, and who doesn’t, you will like this dish! We served ours simply with some boiled rice and some stir fried green vegetables on the side. Alternatively you can have it with all sorts of combinations; as a starter/snack on its own, with coleslaw and french fries is one of our favourites too. Have a beer with it too! when golden brown take the chicken pieces out and heat the oil to very hot again; re introduce the chicken to the oil for a ocuple of minutes. repeat step 9. one more time and add your basil leaves. this will be nice and crispy. now serve it on its own or with some side dishes… yummy! Joanne has recorded a how to make Taiwanese salty crispy chicken 鹹酥雞 street food cooking video so you can see and follow the timings, chopping shapes and sizes, and method step by step, as she prepares this delicious traditional Taiwanese street food. Stay tuned for more help, advice, cooking and shopping! Please join us on Facebook and you will hear about our new recipes and videos first! Nice! It’s one of my favorite snacks! If I can’t get sweet potato flour, can I use regular flour? What will be the differrence? Also, it looks like the video should be re-edited, there’s just a black screen after the end of the recipe. Hi , I　can’t find sweet potato starch . Do you know what kind powder mix together can be same as sweet potato starch ? That looks like ordinary European basil to me? This should be Thai basil (http://en.wikipedia.org/wiki/Thai_basil) which you can usually find at Thai shops in major UK towns and cities. Otherwise, nice looking recipe! Just to say that much to my delight the UK supermarket Asda now stocks Thai basil! It’s 65p a packet in the fresh herb section. Now I’ll be making Salt & Pepper Chicken and Three Cup Chicken much more often! Also it’s very easy to grow your own in summer! This is one of our favorite night market foods. We’ve been looking for a good recipe, forever. Thanks for this one. Hi Taiwan Duck! Maybe you can include Chinese instructions too? For fellow Chinese. Where can you buy Taiwanese salt and pepper? Is there an online store that sells this? what brand would you recommend? Hi the chicken look awesone. But I can not find the taiwan salt and pepper powder. Do you have the recipe? Thnks. 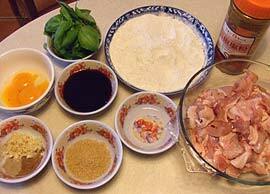 can you show how to make chinese pork bun, it’s a steamed bun with a pork filling and a ground peanut. Hi Cristan, I made steamed pork buns here. I think you can just add ground peanuts. Or perhaps you mean this braised pork recipe. thank you very much for posting all of these recipes. i truly see these foods here in taiwan and so very happy that you are sharing how to prepare all of these.i’m gonna surely cook them one at a time. can’t wait for more recipes. if i want to make the seasoning more spicy is there anything i could add to the taiwanese salt and pepper powder? Hi Bianca, white pepper has heat, so you can add more of that, or perhaps a little cayenne which gives heat without adding very much flavour? Hi this is one of my favorite Taiwan snacks, can you write down the chinese characters for the special salt and pepper mixture so I can ask someone to buy for me in Taiwan? Is it readily available in their grocery store? Thank you. Hello, i really love your recipes! I wanted to try this, but I realised you didn’t mention when do I put in the Sugar? I suppose it’s supposed to be put into with the marinade ingredients together? It seems you’re familiar with taiwanese food. I have a question here. When you go to shilin night market, you see the famous xxl chicken. Do you know what kind of flour they are using? In which, when they fry the chicken, the flour coating create a unique buble texture, golden color, and dont get black easily. we saw a bottle labelled as 炸盐酥鸡粉 5 spice powder on the website http://rasamalaysia.com/salt-and-pepper-chicken-recipe/?pid=2684#image-4728…. would like to know if is this the same as the special salt n pepper powder that u used? and does it serve as a 5 spice powder as well? It’s different brand but it looks like the right thing to use, good luck and happy new year! Hi Dom, that sounds good, I’m hungry after reading that… Please join the TaiwanDuck Facebook! What is the best kind of chicken to use? I think chicken breast can be too dry, right? Does boneless skinless thighs yield the best texture? Thanks. Traditional Taiwanese way does use chicken pieces containing bones. Yes, I think chicken thighs would stay juicy when cooked, better than breast. Good luck Hana! Hello! I just finished making this recipe for my wife and myself. We lived in Taichung for 4 years, but are now in the U.S. This instantly brought us back to Taiwan! So Delicious and very authentic. Thank you so so much. Good to hear it Domenic, that’s exactly why Taiwan Duck is here!